Contemporary and clean details for a roof-top garden. 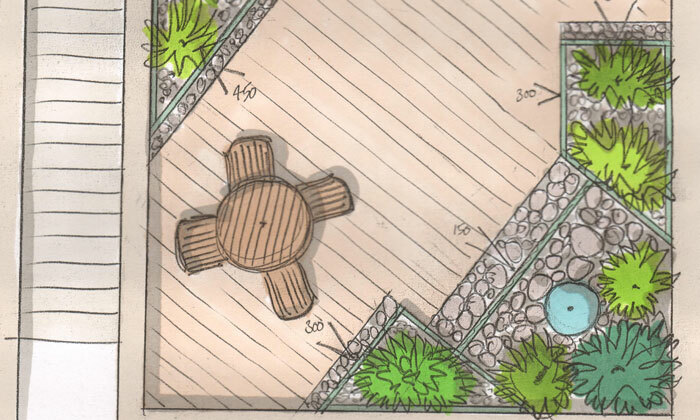 I am asked to do designs in many difficult situations where clients feel really stuck about what to do with their difficult garden areas. With my experience and technical skills I enjoy the challenge of realising a great design in any situation. Roof-top gardens are one particular challenge I have completed a number of times with great success. Obviously there are exposure, structural, drainage and building regulations issues to be considered in such projects, all of which I am very experienced in. I also have my own contacts with engineers to specify and co-ordinate any engineer’s calculation and certification that is required. I also deal with any planning applications, public consultations and building warrants required, right through to completion certificate. In this project the client needed more activity space and feature to transform their bland terrace into a contemporary garden room to suit their very modern high quality architecture. The end result was a very clean and crisp bold design to suit their budget, with a lovely balance of features and planting to create generous activity space with great focal point features including lighting and a water feature. The client was very impressed and reassured by the technical skills and experience I demonstrated for their difficult situation to realise a great design that ticked every box for them.